A folk sculptor and a wandering woodcarver. He was born on 21st June 1814 in Wieruszów. Around 1835 he settled in Wielowieś Klasztorna and later in Masanów. He wandered through the villages and towns of southern Wielkopolska. The trail of his walk he marked with the crosses of God's Agonies which were put at the crossroads, in the gardens and in the cemeteries, mainly in the vicinity of Ostrów and Odolanów as well as Krotoszyn (in Orpiszew), Pleszew (in Kowalew) and hometown Wieruszów (in Sokolniki). Paweł Bryliński was an outstanding artist. He developed his own method of sculpting, style and composition pattern of iconographic programs. The artistic work of Paweł Bryliński is dominating in the Ostrów area and it is expressed in two kinds of folk sculpture. One of them includes separate sculptures of Christ (including Christ Crucified) and saints in the wayside shrines. The other contains the images of saints assigned to the mass of crosses and poles. Compositions of multiple figures present the Passion program and sculptures of saint patron founders and their families as well as conservators of peasant goods and chattels. Special advocates for Wielkopolska people were St. Giles, St. Roch, St. Valentine, St. Benon, St. John of Nepomuk and St. Lawrence. The number of Paweł Bryliński's well-known works is still increasing. At present we know about 35 crosses and six sacred poles as well as many smaller sculptures recently found. The artistic life of God's woodcarver is closed in the period of 1840-1885. The first date is carved on a pole which comes from Ołobok. The other is visible on the foundation board on the cross in Masanów. Paweł Bryliński died on 18th April 1890 in Masanów. Entry to the Baptismal Register. In the photo (Fig. 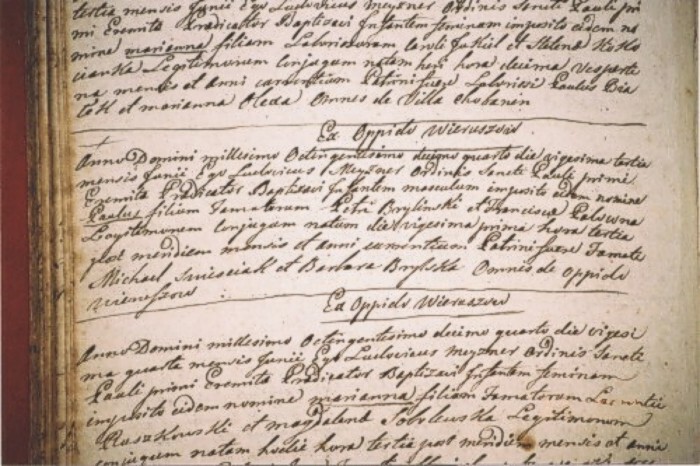 1) - Entry to the Baptismal Register in Latin. "Anno Domini 1814.23.06 I, Ludwik Meyzner, an eremite and missionary of the First St. Paul's Order, baptized a boy named Paweł, the son of Piotr Bryliński and Franciszka Polowna, born on the 21st instant this year at 3 pm, godparents Michał Śmieściak [Świeściak] and Barbara Brylska, everyone from Wieruszów."